Durban - New Zealand captain Brendon McCullum admits the loss of Tim Southee for the tour of South Africa is a big one after the fast bowler suffered a hand injury on Wednesday. "It’s a big loss, Tim’s been our number one bowler in Test cricket for the last sort of a while and also in one-day cricket as well," McCullum said on Thursday. "He’s a real leader of the attack, so it’s going to be a huge loss." Southee, who was not part of the Twenty20 team presently in the country due to paternity leave, was expected to play a key role for a depleted touring team in the One-Day International and Test series. However, he ruptured ligaments in his right thumb while fielding in a domestic cricket match at home and is expected to be sidelined for up to two months. "Obviously our thoughts are with him because I know he had a keen eye on this series to test himself out against some of the world’s best test bowlers in (Morné) Morkel and (Dale) Steyn," McCullum said. 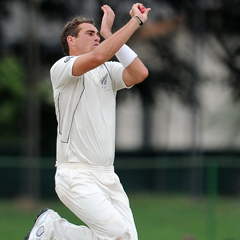 Southee has been one of the most impressive bowlers for the Black Caps in all forms of cricket over the past year and also played a key role in their recent 1-1 drawn Test series in Sri Lanka. New Zealand were already without leading bowler Daniel Vettori due to injury, while top batsman Ross Taylor pulled out of the tour due to a spat with the board.